* The main economic institutions are no longer willing or able to provide opportunities for the majority of individuals, families and communities to achieve a decent living, with long term unemployment, homelessness and poverty increasing exponentially. Massive cynical and criminal financial and commercial manipulations and speculations are allowed to happen and to continue. * Economic and political power becomes concentrated in fewer and fewer hands, and moved ever upwards. Already limited openings for popular participation in decision making are steadily closed off and hemmed in. * Social mobility becomes frozen, and sharp class divisions are deeply ingrained. * Ruling upper strata increasingly fear and develop increasing contempt and hatred toward the poor, the unemployed, marginalized minorities, and even everyday working people, pushing for lower levels of pay and more difficult work loads and longer work periods. * Divisions among the lower strata are exacerbated and encouraged by the upper classes on the basis of race, nationality, gender, sexual identity, age, employment status and all kinds of other false and exaggerated “differences”. * Organizations of mutual support, solidarity and fight back among the lower social classes are attacked, weakened, destroyed, bought off and made impotent. Intensified competition among unorganized workers and functionaries for dwindling opportunities becomes rampant. * Military and police forces are increased in size (this varies) and armed with ever more deadly weaponry. Wars become more common and ongoing, as ruling strata hunger for dwindling resources, markets, and the power to counter their rivals around the world — and to suppress periodic rebellions within their “colonies”, and increasingly within their own countries, partially through police spies, surveillance, informers, provocateurs, and agents. * This all leads to inevitable overreach and over extension, as well as the financial strains of maintaining, replacing and constantly revolutionizing military, intelligence and police technology and forces. * Military personnel and veterans are increasingly abused and cut off from support and their promised rights. Mass unemployment assures a constant flow of replacements — fresh blood. * Mass arrests, convictions, and incarcerations become the order of the day. A huge prison industry further saps the falling resources of the society. * Educational systems, opportunities for learning, social and public services, and the basic physical infrastructure are allowed to crumble and decay, and are not maintained. Access to quality health care and health maintenance possibilities become compromised, even in the midst of programs and facilities periodically implemented and provided. * A general fraying of social and community cohesiveness sets in, and alienation increases between people. * The physical environment is constantly and increasingly violated and trashed in the never ending quest of the ruling strata to exploit and ravish the resources of the planet — at any cost. Does any of this sound familiar or ring a bell ? Allowing for exceptions and occasional islands of hope and glimmers of positiveness, can anyone truly doubt that the above litany of horrors pretty much describes our current state of affairs in this country and this world ? The question, of course, at least among those of us who understand the unfortunate reality of these facts, is: What can be done ? What needs to be done ? What are the possible ways forward and out of this vortex of destruction and calamity ? I’d like to hear from you. What are your thoughts and conclusions ? I’ll get into mine at a later time, but soon. Take care. “VOLUNTEER<" if they think it is damn important to go die for NOTHING. I would change one word…in the title: “Signs of a FAILED Empire”. Empire and democracy are incompatible. The notion that they can co-exist is but another false belief in the American psyche, on par with the naive myth of “The American Dream”. Typically, Empire prevails over democracy, until there is a “Suez moment” that dramatically alters the landscape, or that wakes people up ( enough of them ) to some semblance of reality. 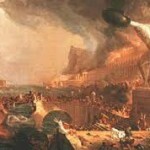 ( The Emperor’s New Clothes is another example of a “Suez moment” of revelation ). While I have had disagreements with Mr. Griffin, his reasoning here is solid …and not at all overwrought. I’m even more cassandra than he is. To answer his questions: “What can be done? What needs to be done ? ” … I would say to NOT be a martyr to a phony construct, and to prepare for the inevitable collapse and escape if one can. Americans are too embedded and comfortable in their conceit, nationalistic pride, and stupidity to change. They have adopted a ‘culture of hustling’ as their survival mechanism; and a mentality of collective Alzheimer’s on a march to mass suicide. Enjoyed the editorial, but to be clear, history isn’t normative. Just because we in the present see similarities with the past, doesn’t mean history will repeat itself. That said, I think history is suggestive and one can learn a lot about the American Empire by studying past empires. Yup. There’s no real denying it. Hard thing to digest though and still live peacefully with oneself.. we are ALL Part of this demise through our collective human tendencies to want more than the basics in life. What sorts of opportunities in particular do you value more? Carrying a gun in Starbucks, or good affordable health care and education, for example? Or how about a decently paying job? Well, for starters, you can get better medical care in Cuba; live longer in most other developed countries; be better educated in Japan; have a better time finding a job in China or India; have less chance of being thrown in jail in almost every other country; and we could go on and on. It’s fine to be proudly American — I certainly am — but to be smugly complacent about the mess we’ve made of our once wonderful nation makes no sense. We can do much better, and we should. Nobody spends months working in secret to turn a 1948 Packard into a boat to escape Paradise. For Pete’s sake, wake the hell up!! You want to go live in India or China, go ahead. One of my good friends is going to marry a PRC citizen. She’s looking forward to raising her children in the U.S., not the PRC. Wake up, wake up, wake up!!! I get so tired of the shopworn and completely false leftist narrative about hellholes like Cuba or China. With all our problems, we still have the best deal going by far. Open your eyes. Divisions among the lower strata are exacerbated and encouraged by the upper classes on the basis of race, nationality, gender, sexual identity, age, employment status and all kinds of other false and exaggerated “differences”. Scary opinion, but within eyesight of the days we see. Although, with the decent of the white american male,divisions have been based on financial situations, not so much race. At the very least, this is a template for avoidance and reminds us of what we need to take care, avoid and save from destruction. The Millennial-filled revolution currently upon us might call something like this their mantra and we will hear and see more like it. The times are changing.